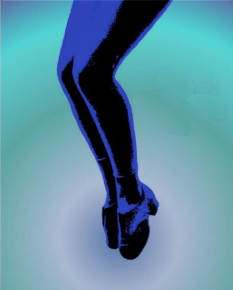 Tap training helps to increase leg and core strength, musicality and rhythm, and showmanship. Tap class is a fun and exciting way to explore dance movement and learn basic through advanced steps. It also helps to improve coordination and teamwork skills. Tap dancing is a great compliment to any dancer wishing to perform in musicals or play a musical instrument because of its important concentration on musicality and rhythm. Tap dancing helps students to find their inner performer and challenges the student to open up and become a versatile performer. Tap dancing focuses on learning complex patterns of foot movement, changes in tempo and different methods of weight transfer while dancing in order to produce a certain sound or look that accompanies the type of choreography or steps that the students are working on in class. This first level introduces students to fundamental tap techniques arranged in combinations and performed in class as solo or group demonstrations. Students take an active part in the creation of combinations, and learn how to perform with energy and how to bring their own personality to each and every performance. The main goals in this level are identifying, utilizing, and demonstrating tap terminology as well as understanding tap as a form of entertainment. Continuing the foundations of Tap I. In this second level, students continue to develop their tap technique by enriching the vocabulary and improving the quality of the techniques already introduced. The Intermediate technique builds upon rhythms with more complicated, but repetitive sound elements that require students to have a higher level of concentration and self-awareness. Wings, Pullbacks and more intricate tap combinations are introduced. In this final level students will work on improving the speed and precision of the movements learned in Tap II, and will also learn more complicated and interesting rhythms. The main goals for this level are to gain confidence and freedom of movement and to be able to utilize the knowledge to create tap improvisations. Students will have increased speed and coordination in their footwork and they will be able to learn more complicated steps experimenting with various levels and styles of tap dance. Students will develop a mastery of tap skills such as Time Steps, Double Toe-Stands, basic Wings, Pullbacks and Rifts. We offer adult tap classes. See the Adult Dance page for more information. 1 Stated prerequisite must be completed prior to starting this class.